William Goldman, The Princess Bride (1973). I’m starting a new category of posts, about agreements where their wording, upon examination by a court, didn’t manage to do what the parties probably had set out to do. 18. If ASSIGNEE shall at any time default by failing to make any payment hereunder … and ASSIGNEE shall fail to remedy any such default within sixty (60) days after written notice thereof by DEVELOPER, then DEVELOPER may, at its option, terminate the Assignment by notice to that effect…. 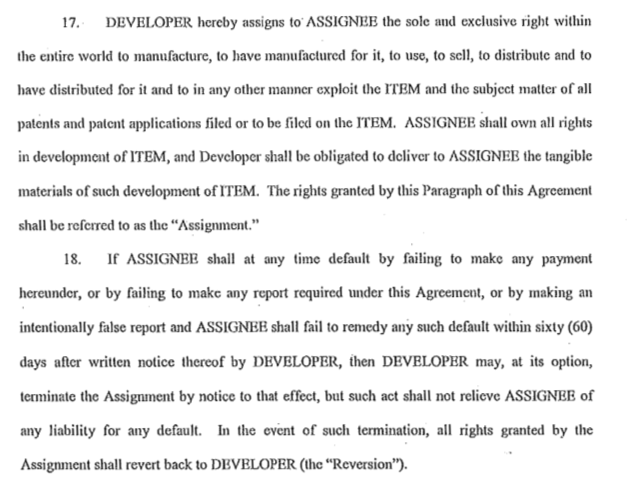 In the event of such termination, all rights granted by the Assignment shall revert back to DEVELOPER (the “Reversion”). Spin Master got a patent on the invention and the Rehco inventors assigned the invention directly to Spin Master. Many years later, Rehco alleged that Spin Master hadn’t paid the royalties and sued for past royalties and for patent infringement, on the theory that the patent had reverted to it under paragraph 18 of the agreement. [A]ssuming Spin Master did breach the Airplane Agreement, only the rights set forth in the Assignment Clause would have transferred back to Rehco. Such rights included “the sole and exclusive right . . . [to] exploit the [Airplane] and the subject matter of all patents and patent applications . . . on the [Airplane],” (Airplane Agreement ¶ 17), but not the patent rights themselves, which had been granted to Spin Master under a separate provision of the Airplane Agreement and, therefore, were not subject to the Reversion Clause. The [reversion] argument is somewhat puzzling, however, since a reversion typically implies “the returning of property to a former owner,” see, Miriam-Webster Online Dictionary, http://www. miriam-webster. com/ dictionary/ reversion (last accessed March 12, 2014), and Rehco never owned the ‘893 Patent. Indeed, as the Airplane Agreement made clear, the power to obtain and hold patent rights in the Airplane belonged to Spin Master alone. (Airplane Agreement ¶ 3). That is technically correct because, rather than having the Rehco inventors (presuably Rehco employees) assign their rights to Rehco, Rehco saved a step and had the employees assign the rights directly to Spin Master. Had the Rehco employees assigned to Rehco, then Rehco assign to Spin Master, the word “reversion” would have made more sense to the court. The fact that Spin Master was called the “Assignee” throughout also suggests that the parties contemplated that Rehco was assigning patent rights; it would have been an odd choice of words if the parties’ contemporaneous understanding was that Rehco never had any patent rights to start. But the court read the agreement the way it was written, with a defined “Assignment” that was really a license and a defined “Reversion” of that “Assignment.” Just probably not what the parties meant. Rehco LLC v. Spin Master, Ltd., No. 13 C 2245 (N.D. Ill. March 17, 2014). A somewhat ironic result that shows the dangers of skipping steps in setting out the chain of title. In contrast to Rehco’s somewhat feckless approach to title, the parties enumerate assigned ownership rights when they likely wanted to assign the entire patent to Spin Master with it reverting to Rehco if Spin Master defaulted. Rehco suffers for its inconsistency.